Beautifully designed socks delivered to your door every month so you can have more fun. Join the elite sock club where each month we send a pair of high-quality socks. 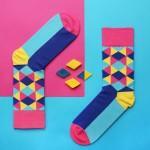 At Look Mate we collaborate with leading designers to design and manufacture exquisite socks. Designers commissioned are anyone from architects to visual artists. Be the first person to tell us what you think about Look Mate Sock and you'll save £2.50 on your next purchase!